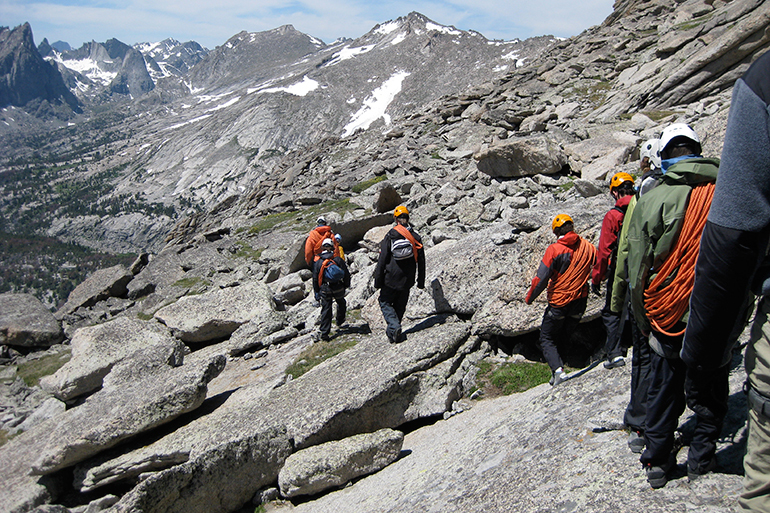 The Wind River Range is one of America's most spectacular wilderness ranges. This vast 110-mile uplifted spine offers limitless climbing and hiking in a remote setting. 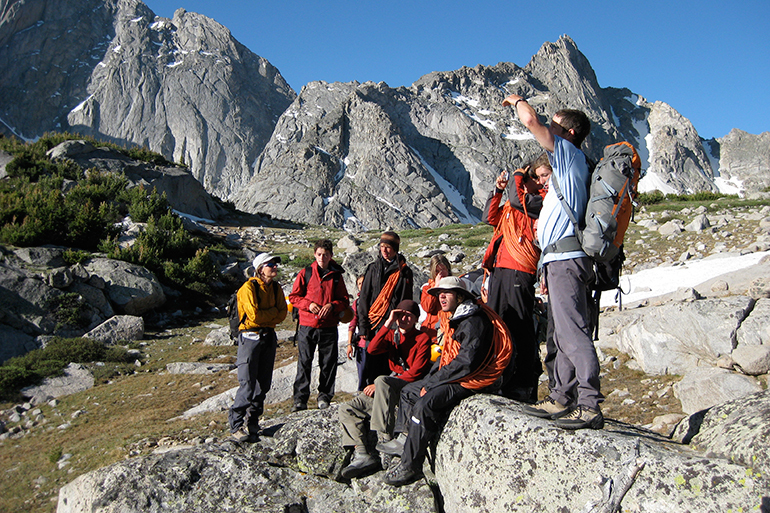 Exum is excited to offer custom private climbing and backpacking trips into this mountain paradise. 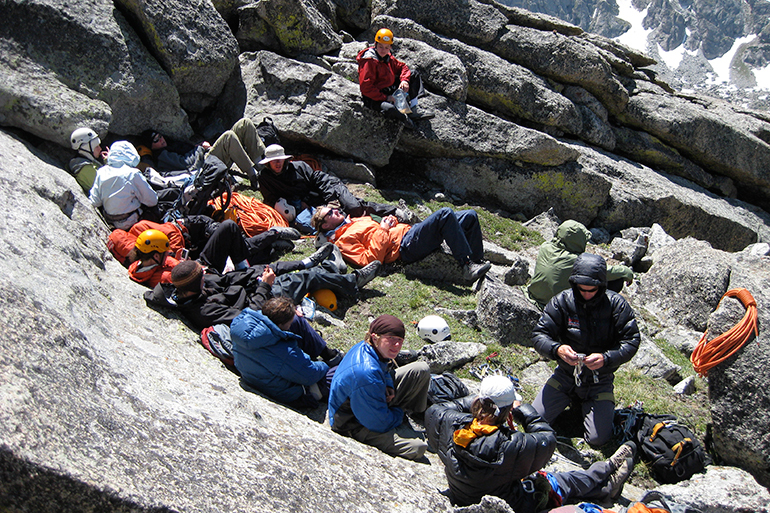 Climbing trips are based out of a camp in one or two areas. “The Cirque”,as it is known to those fortunate enough to have climbed there, is a collection of peaks, spires, and walls with some of the most memorable names of any climbing area in the world: Warbonnet, Warrior, Watchtower, Sharks’ Nose, Overhanging Tower, Wolf’s Head, Pingora. The routes are worthy of the names and many deserve to be described as legendary. 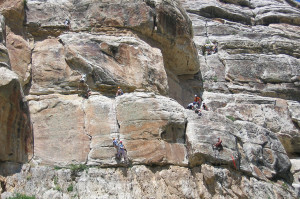 Several of the routes were made famous after being included in Fifty Classic Climbs of North America. A dozen others are equally famous. 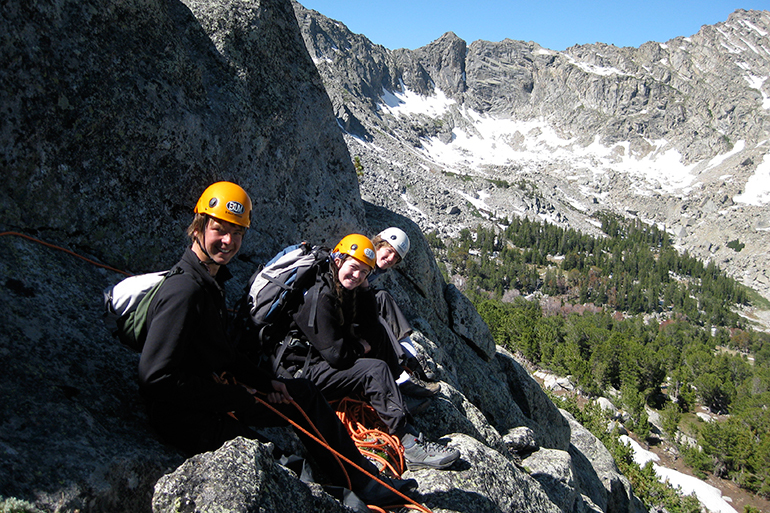 The collection of peaks surrounding Deep Lake and Clear Lake are renowned for clean rock and superb climbing. The approach to Deep Lake is short and the elevation gain is minimal, attributes a rock climber considers virtues. The area between the lakes is blessed with many fine campsites a midst stunning alpine scenery. 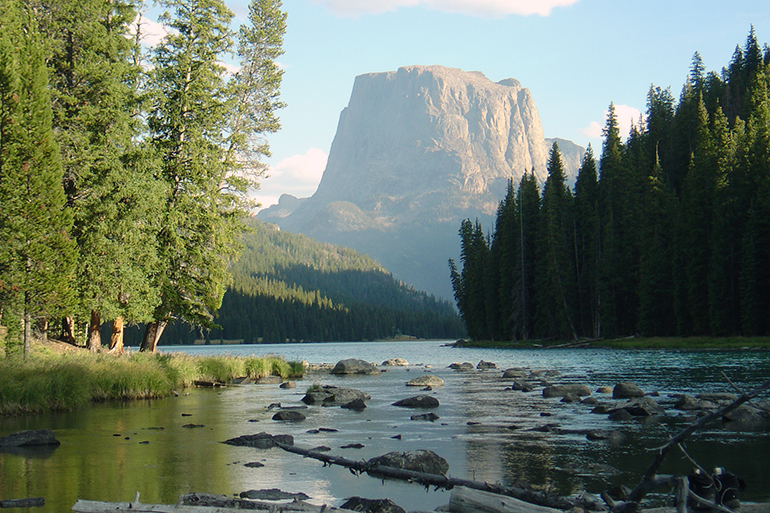 At 13,804 feet, Gannet Peak is the highest mountain in Wyoming, being 34 feet higher than the Grand Teton. It is also one of the most isolated and difficult peaks to reach. The approach crosses alpine tundra before dropping into the forested Dinwoody Canyon, and then climbs to the base of Dinwoody Glacier. Exum recommends at least six days for an expedition to Gannett Peak. If you have more time, consider extending your trip to seven or more days for rest, bad weather days, fishing, ascents of satellite peaks, or more difficult routes on the mountain. Titcomb Basin is a high alpine valley with no trees but many tarns and lakes, some of which contain large trout. The approach from Elkhart Park, above Pinedale, is long and arduous. 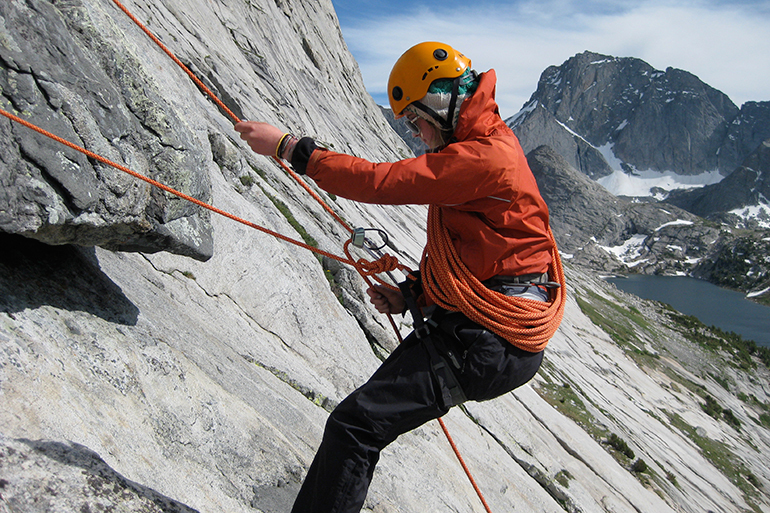 Joe Kelsey, in his guidebook, Climbing and Hiking in the Wind River Mountains, says Titcomb Basin “offers the greatest variety in the range–walk-ups, easy and difficult rock climbs, ice climbs, and mixed mountaineering routes”. 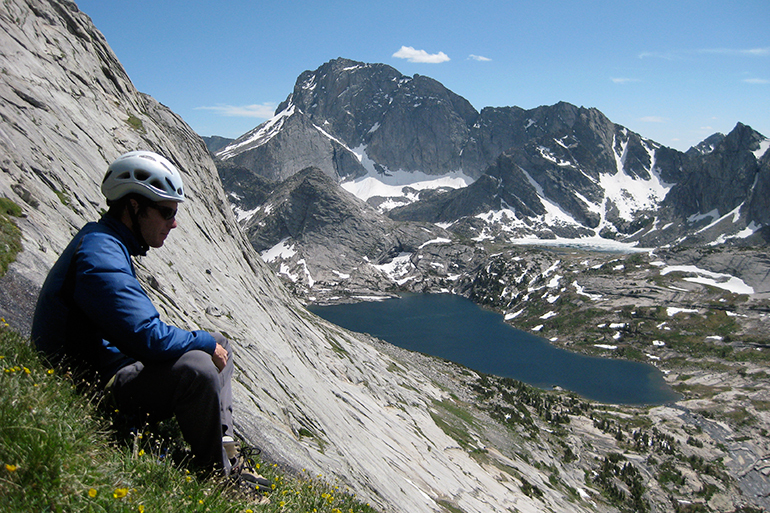 Exum suggests you plan on spending a week tin Titcomb Basin to enjoy its many splendors. 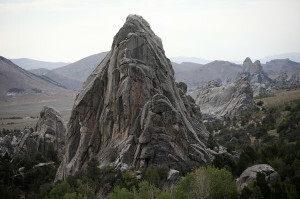 The City of Rocks and the adjacent Castle Rocks, in southern Idaho, are a rock climber’s paradise. 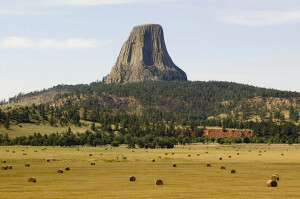 Devils Tower is located in the grasslands of northeastern Wyoming and is famous for steep crack climbing. A three hour drive from Jackson, the Lander region boasts an incredible variety of sport and traditional climbing.